We can't guess how many jobber's sold Hercules engines but the above were the most popular. Parts on this page are for the models listed above. However, some of these parts will also fit the not so common 'N' (contact us for more info). Use these links for the JI/JK and XI/XK parts listings. We do not have a listing for Thermoil. 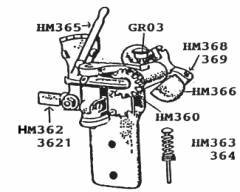 When ordering parts for Hercules please give the HP and the letter with it off the serial tag on the top of the engine (Jaeger engines have an extra plate on the lower side of the block-do not use info off of this tag for ordering). Here are some other notes that may be helpful to you. No Serial Plate? Give us the diameter of piston and we'll ask you a few questions to determine HP, etc. 1-1/2 to 2HP Cyl. blocks and caps have a double liner for the main bearing, one is a factory installed poured liner, not replaceable, and must be poured. The replaceable insert sits in this (APPLIES ONLY TO 1-1/2 to 2HP engines). History of Hercules by Glen Karch 1914-1934 This 20 year period is when most of the engines in collector's hands were made. Although this book is on Hercules engines it is good reading for anyone. 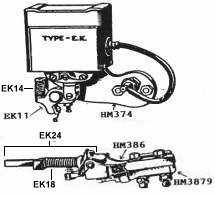 The Following carb parts are for kero. pump type carbs. For related parts see "Fuel Line Assy", etc. These mufflers are nicely cast with square head bolts.